It seems you can’t go anywhere without hearing about what a miracle coconut oil is, and with good reason. Coconut oil may seem like just another blink-and-you’ll-miss-it fad, but this one has stuck, and for longer than you might think. People use coconut oil to get great hair, great skin, great health, and so many more things, but did you know that your dog can benefit from coconut oil too? There’s some pretty incredible claims out there about what coconut oil can do, but there’s a reason people are raving about it, and it’s backed by science. Coconut oil is high in fat – mostly unsaturated fat comprised of Medium-Chain-Fatty-Acids (MCFA). About half of these MCFAs are lauric acid – which have antiviral, antifungal, and antibacterial properties. Lauric acid is also found in abundance in breastmilk, and it’s credited with helping keep babies healthy naturally. These MCFAs are responsible for all the wonders that coconut oil works, and your dog (especially your senior dog) can experience them too. 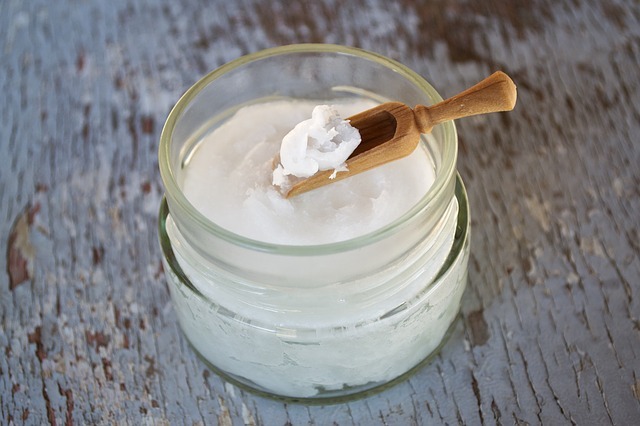 Coconut oil is an ideal moisturizer for skin and hair because it’s absorbed by the body more easily than other oils. It’ll help protect against cracked paw pads and elbow calluses, especially as your dog gets older and spends more time laying down. It can also be used to treat and prevent fungal infections, and will help relieve your dog of itchy skin due to fleas, allergies, and other irritants. It’s safe to apply topically, and when massaged into your dog’s coat, the Vitamin E it contains will give him smooth, shiny fur. It’ll even nix that dog smell in between baths and make his scent more like that of a piña colada! Coconut oil aids in the digestion of food, and the fats (MCFAs) contained in it will help your dog’s body absorb the nutrients in his meals. This is especially beneficial for dogs who are eating less due to illness or age, as he can get more out of what he does manage to eat. It can help balance his digestive system, relieving issues like diarrhea and inflammatory bowel syndrome. Because coconut oil is high in fat, your dog shouldn’t be allowed to eat as much as he’d like, but some added to his diet can benefit him in amazing ways. Because of it’s antibacterial properties, coconut oil is thought to help keep your dog’s teeth clean by fighting the bacteria that thrives on plaque and tartar. Your dog may tolerate it better than toothpaste, too, because of it’s delicious taste. It’ll improve his doggy-breath, too, even if only for a little while by fighting the bacteria that causes bad breath and making his mouth coconutty. MCFAs are quickly and easily metabolized by the body, becoming an immediate form of energy instead of being stored as fat within the body. 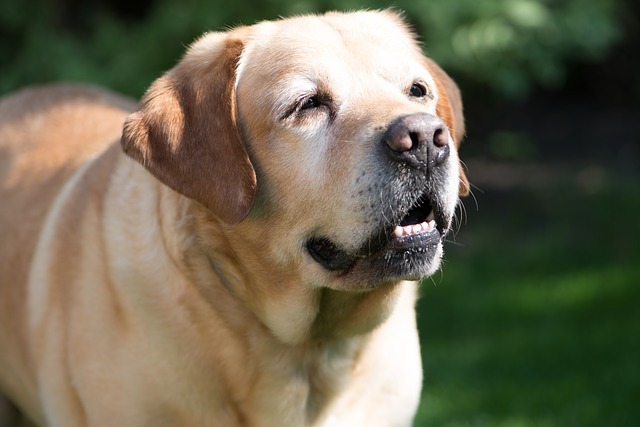 Senior dogs tend to become more lethargic as they get older, and though they need their sleep (a whopping 15 – 18 hours a day!) you can help them make the most of the time they spend awake by using coconut oil to give them a boost. Your dog’s body will quickly break down the fats in the coconut oil, and your dog will feel more like the pup he was before! This means more time for the walks, play, and exercise your dog needs to keep his body and mind at it’s best. Many types of pain felt within the body are caused by inflammation – which can be easily relieved with coconut oil. This includes the joint pain that often plagues older dogs. It will also help your dog build strong bones and aid thyroid function, which directly affects your dog’s weight. There are even claims that coconut oil can help prevent diabetes, based on a study which showed that MCFAs can help lower the risk of obesity and fight insulin resistance. Coconut oil is a boon to senior dogs, who are more prone to suffer from all of these conditions than younger dogs. It’s easy to see how all dogs, but especially senior dogs, have a lot to gain by using coconut oil! Be sure to talk to your vet if you have any questions about how coconut oil can benefit your dog. 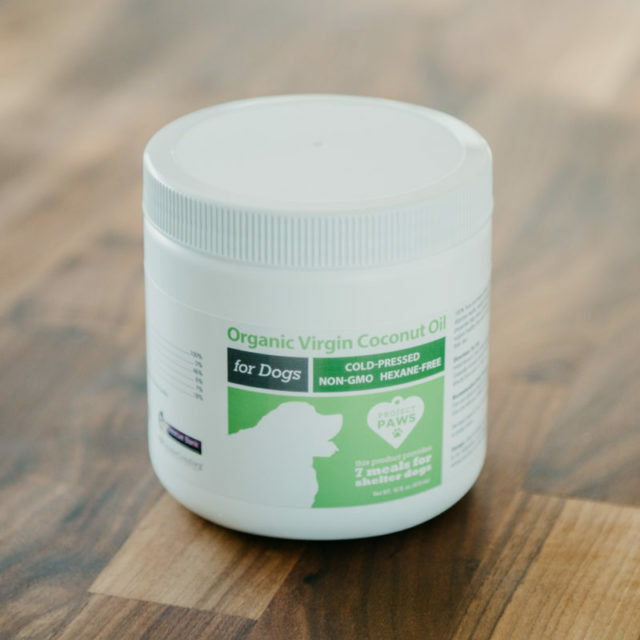 Project Paws® Organic Virgin Coconut Oil is made from one ingredient – pure organic coconut oil! Your dog can experience all of these benefits for himself, and you’ll get a happier, healthier pup in no time! 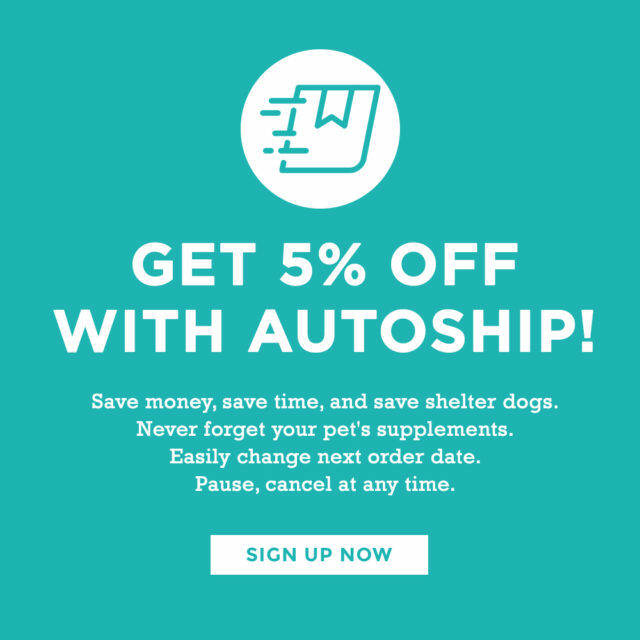 Ordering for your dog is easy and hassle-free with AUTOSHIP, which will keep you stocked and won’t ever forget to reorder! Just sign up for a recurring purchase when you add the item to your cart, and it’ll show up per your schedule. Edit or pause at any time, it’s easy! And, like all other items from the iHeartDogs store, every order will feed shelter dogs in need!